Very frequently product managers, application engineers and other technical experts come across the metrological terms of calibration and verification. For some of them these two concepts are partially understandable, but for others these terms are unknown or confusing. In the article below we define Verification and Calibration concepts and highlight some of Endress+Hauser’s relevant offerings. An interpretation of verification consists of checking calibration results as “objective evidence” to comply with a “specified requirement”, such as the Maximum Permissible Error (MPE), defined either by a manufacturer, a legal metrology organization or an end-user (i.e. process application). This situation is illustrated in Fig. 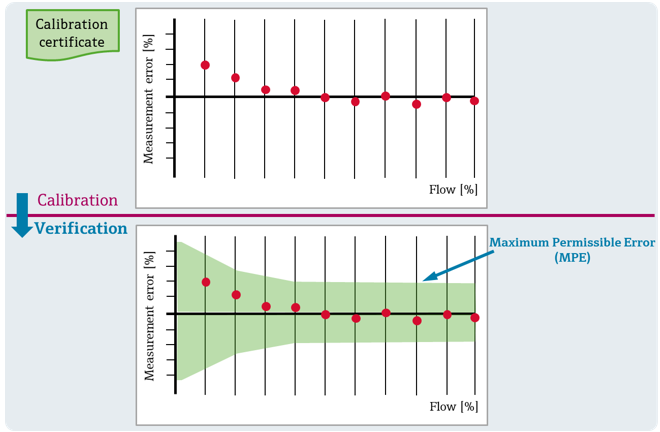 1, where the device’s relative measurement errors obtained by the calibration rig turn out to be smaller than the MPE, meaning that the flowmeter (item) fulfills the specified requirement. Heartbeat Technology verifies the correct function of the measuring device according to the specifications and generates a protocol without process interruption. The in-line verification is a comparison of the results obtained from the Unit Under Test (UUT) against the In-line Ultrasonic clamp-on flowmeter. A verification certificate which indicates the measured error between both the measurements is generated. According to the VIM, calibration is a procedure to establish a relation between a quantity value given by a UUT and a reference quantity value (ref) obtained by a calibration rig, within its associated measurement uncertainty. One fundamental requirement for carrying out a calibration is that the reference system must have traceability to the fundamental units of measurement needed to reproduce the unit flow. On-site calibration is performed by highly trained engineers. Convenient and cost-effective, it removes the need to send instruments off-site as our specialists come to you, keeping downtime to an absolute minimum. It also offers the highest flexibility as calibration can be scheduled according to your process demands. Laboratory Calibration Services are one-time or repeating contract-based calibrations of customer’s instrumentation, both Endress+Hauser and third party, carried out in a facility owned by Endress+Hauser South Africa. Calibration Services performed in laboratory have the advantages of the best calibration uncertainty and wide calibration ranges. Calibration Services are one-time or repeating contract-based activities for performing calibration of customer’s instrumentation. Both Endress+Hauser and third-party instrumentations can be calibrated at its place of installation (on-site calibration) as well as at Endress+Hauser facilities (laboratory calibration). The main objective is to check the accuracy of measurements by comparing customer’s device values with the values of known traceable references. The results of the comparisons are recorded in calibration certificates. to satisfy requirements of industry regulators and standards like FDA, IFS, ISO 9000 etc. Calibration Management Service is an optimization service where Endress+Hauser take day-to-day management responsibility of customer’s calibration function. Goals of this outsourcing are improving customer’s plant operations, securing calibration process compliance to internal and external regulations while reducing its costs. 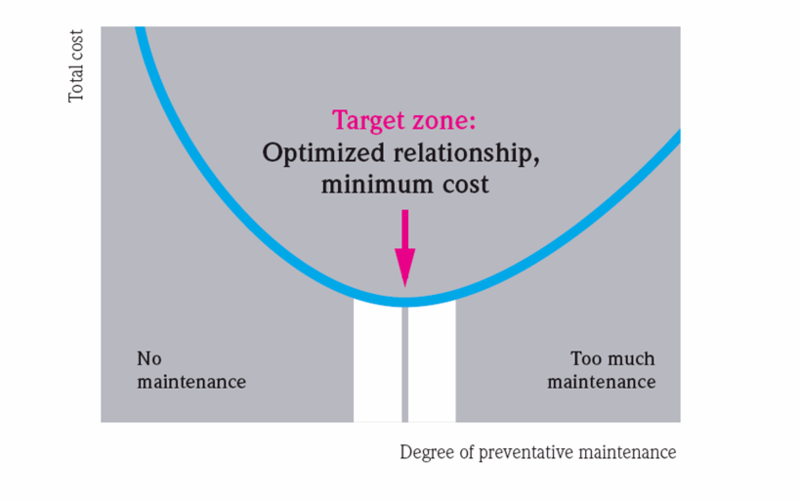 Let us help you optimize your plant maintenance.